Study moderators examined interactions between children's parasympathetic and sympathetic nervous systems (PNS and SNS) activity in order to achieve a greater specificity in the prediction of externalizing problems in the context of interparental conflict. Findings are robust across the three studies and provide the first reported evidence of interactions between PNS and SNS activity. Findings extend current theory indicating the importance of multisystem investigations for clarifying inconsistencies and discrepancies in the literature linking environmental stress, physiological responses, and child adjustment. Mona El-Sheikh (Ph.D., 1989, West Virginia University) is an Alumni Professor in the Department of Human Development and Family Studies at Auburn University. Her research program focuses on associations among family risk, especially destructive marital conflict, and child outcomes across multiple domains. Her research has emphasized a biopsychosocial approach for the development of adjustment, social, cognitive, and physical health problems in the context of family risk, especially assessments of the intervening role of physiological (e.g., autonomic nervous system activity) and biological (e.g., sleep) regulation in the context of family adversity and child development. Chrystyna D. Kouros (Ph.D., 2008, University of Notre Dame) is a Post-Doctoral Research Fellow in the Department of Psychology & Human Development at Vanderbilt University. Her research focuses on the interplay between family processes (e.g., marital functioning) and mental health. Specifically, her research interests include: (a) examining how couples interact during everyday marital disagreements; (b) the impact of marital functioning on spouses' mental health; and (c) children's immediate emotional and behavioral reactions to everyday interparental conflict, including the effects of marital conflict on children's broader adjustment. Stephen Erath (Ph.D., 2006, Penn State) is an Assistant Professor in the Department of Human Development and Family Studies at Auburn University. His research focuses on children's exposure to stress in family and peer relationships, their reactivity to stress and regulation of interpersonal stress, and its implications for social competence. E. Mark Cummings (Ph.D., 1977, UCLA) is the Professor and Notre Dame Endowed Chair in Psychology at the University of Notre Dame. His research program focuses on the effects of marital conflict on children's emotional and behavioral adjustment, as well as the role of marital conflict in child development in multiple contexts, including parental depression and community violence. Peggy Keller (Ph.D., 2006, University of Notre Dame) is an Assistant Professor in the Department of Psychology at the University of Kentucky. Her research focuses on the effects of family stress on children's psychological and physical health. Specifically, her research interests include family-level (e.g., marital conflict) and child-level (e.g., physiological reactivity) processes that account for the link between parental psychopathology and children's adjustment problems and risk for overweight. Her research has emphasized a developmental psychopathology perspective. Lori Staton (M.S., 2005, Auburn University) is a Ph.D. candidate in the Department of Human Development and Family Studies at Auburn University. Her research focuses on the role of physiological regulation and reactivity to stress in the relationship between family stress and child emotional and behavioral adjustment, cognitive functioning, and physical health. 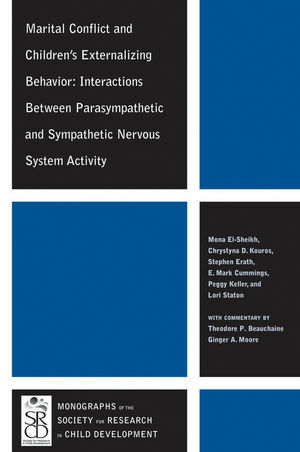 Specifically, her research emphasizes parasympathetic and sympathetic nervous system functioning. II. INTERACTIONS AMONG MARITAL CONFLICT, SYMPATHETIC, AND PARASYMPATHETIC NERVOUS SYSTEMS ACTIVITY IN THE PREDICTION OF CHILDREN'S EXTERNALIZING PROBLEMS. III. ADDITIONAL TESTING OF THREE-WAY INTERACTIONS IN AN INDEPENDENT SAMPLE. IV. ADDITIONAL CONSIDERATION OF THE ROLE OF SYMPATHETIC AND PARASYMPATHETIC NERVOUS SYSTEMS ACTIVITY IN A SAMPLE OF 6-12-YEAR-OLDS.